Kalyan Minaret was erected in 1127 by Arslan-Khan and is considered to be the symbol of the city. According to the records of the time, the builders made an error in its construction, and it soon fell to the ground. 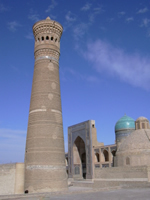 When the remnants were cleared away, Arslan-khan ordered that a new minaret, stronger and more beautiful, the likes of which had not been seen in the entire East or in Bukhara, be built. The Kalian Minaret rises to a height of forty-six meters above the city. The minaret is decorated with 14 parallel bands, which are not repeated. During the repairs in 1924, the minaret was faced with glazed bricks where the frieze had been. At the present time, the lower part of the minaret has been restored and the layers of dirt accumulated over the ages cleaned off. The inside of the minaret is hollow. It is possible to go onto the roof of the minaret via a special footbridge. Throughout the eight centuries of its existence, it served a watchtower and lighthouse for trade caravans, the guard-post for observers to notify the city of approaching danger remains in place. In the eighteenth and nineteenth centuries, the minaret acquired an unsavory reputation and was known as a "tower of death": condemned were hurled to their deaths from this tower by order of the emir. Today this outstanding work of architecture, the perfect architectural forms of which have long served as an example for similar works in the Muslim East, calls forth only wonder.